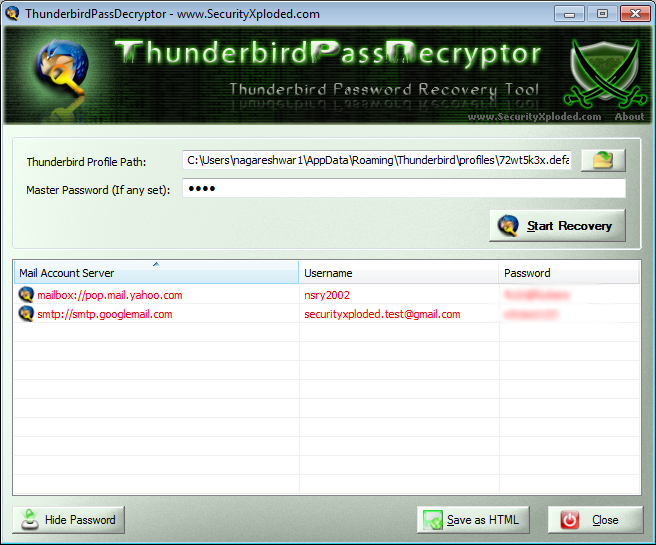 ThunderbirdPassDecryptor is the FREE software to instantly recover the stored mail account password by Thunderbird. Thunderbird is a free, open-source, cross-platform application for managing email and news feeds. Like other email clients, it also stores the mail account passwords on the local system for subsequent logins so that user don't have to type the password everytime. Easy and faster to use with its enhanced user friendly interface. Instantly recover the stored mail account password by Thunderbird. Thunderbird Password Decryptor helps in instantly recovering such stored mail account passwords and get the complete account access details. You can also use it to recover the Thunderbird account passwords from other system which is not alive or running on completely different platform. * Supports recovery of passwords from local system as well as remote system. * It can recover passwords from 'Thunderbird Password Store' even when it is protected with master password. * Passwords are not shown by default for security reasons as it is sensitive data. However user can toggle this behavior using 'Show Password' button. Qweas is providing links to Thunderbird Password Decryptor 1.7 as a courtesy, and makes no representations regarding Thunderbird Password Decryptor or any other applications or any information related thereto. Any questions, complaints or claims regarding this application Thunderbird Password Decryptor 1.7 must be directed to the appropriate software vendor. You may click the publisher link of Thunderbird Password Decryptor on the top of this page to get more details about the vendor.